For today’s Stinky Cheese Tuesday, from left to right, we have Blarney Castle, Tomato Basil Cheddar, and Caraway Havarti. Since yesterday was St. Patrick’s Day I figured that a nice Irish cheese was in order. Kerrygold’s Blarney Castle fits the bill quite well. A smooth textured cheese with a rich creamy flavor, it comes across as something like a cross between gouda and provolone. 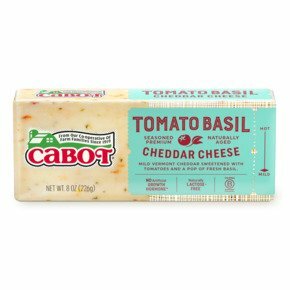 Cabot’s Tomato Basil Cheddar is today’s winner, in my humble opinion. The acid from the tomatoes meshes with the sharpness of the cheddar to create sheer joy. The basil smooths everything out and provides an herbaceous undercurrent. It is like eating a grilled cheese with tomato soup without the bread! Last, but certainly not least, we have Dofino’s Caraway Havarti. This stuff is like eating a grilled cheese on rye with the caraway flavor being quite pronounced but not overpowering. It is a solid addition to the Stinky Cheese Tuesday lineup.